As home prices in the Bay Area continue their remarkable upward trajectory, observers are beginning to talk of the once-unmentionable: finally erasing the losses suffered in the housing market collapse of 2008-2009, when property values dropped like a lead balloon. Figures from the research firm DataQuick show that the median price paid for a home in the nine-county Bay Area in May was $519,000 — 78 percent of the peak median price of $665,000, set in June 2007. 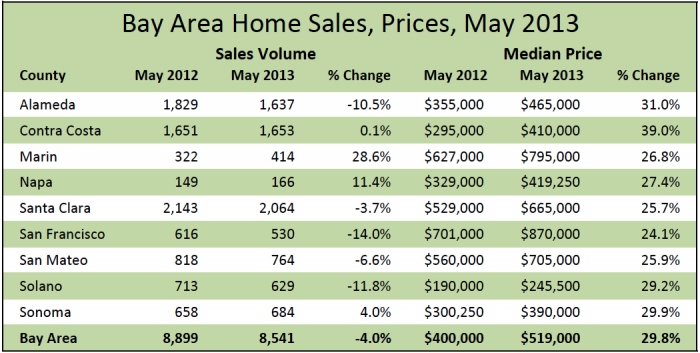 The Bay Area median price dropped as low as $290,000 in March 2009, an overall decline of $375,000, or 56 percent. Home prices have been galloping higher in recent months, however, with May’s median price up 30 percent from a year earlier. Economists say the spike in prices is evidence of a healthy housing market and shows no sign of slowing down for at least another year. They credit the rise to an improving economy, low mortgage rates, pent-up demand, and continued investor interest. While prices are rising, total sales in May were down 4 percent from a year ago because of the tight supply of homes on the market. However, that low inventory may be starting to rise, as underwater homeowners realize they may have already regained equity and could make a healthy profit in today’s competitive marketplace.